The Seiko Coutura SSC376 is a marvel timepeice with a Japanese Solar movement being the core of its power. It is a perpetual chronograph watch, with the capability of measuring up to 60 minutes in 1/5 second increments with a split time measurement function. The Coutura has a perpetual calendar which is able to regulate to odd and even months, including February of leap years up to the year 2100. Moreover, once fully charged, the Coutura has a six month power reserve with a power indicator, and a leap year, month, day and date indicator. This beautiful piece is protected by sapphire crystal glass, and is altered by an exquisite cabochon crown. The Seiko Coutura has been created with LumiBrite hands and markers to light up all wrists in the dark. 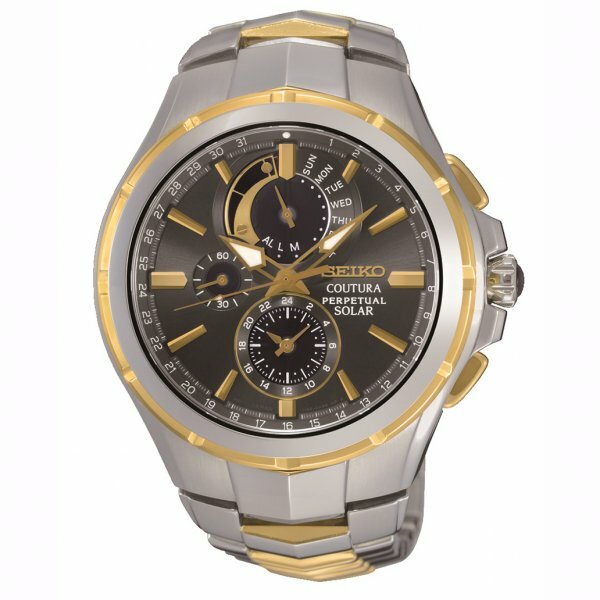 The Seiko Coutura SSC376 comes with a two year Manufacturer Warranty. When purchased from Tic Watches free UK delivery is included with this timepiece and an extended thirty day return period.